It may still be summer, but slowly and steadily, some of our favourite brands are preparing for autumn and dropping coats into their new-in sections. And just like buying swimwear early, thinking about your coat way ahead of the cooler months (aka when key styles sell out, leaving you with limited options) is always a good idea. But which types of coats are right for you? There are the classics—think camel coats, maxi lengths and cosy faux fur—but there are also a few key styles that started out as micro-trends but have now graduated to become winter wardrobe must-haves well worth considering. To guide you through the various types of coats on offer, we've looked to our favourite influencers for inspiration. Consider this your winter coat cheat sheet WAY ahead of time. Style Notes: A classic trench is the ultimate grab-and-go option. Wear loose over printed dresses or smart workwear, or belt up over chunky knits—every wardrobe needs one and right now the vibe is go for something with a utility feel, like Pernille above. Style Notes: We challenge you to find a warmer, cosier coat than this one. Choose between neutral hues and shorted, cropped iterations, or go mid-length and maximalist on colour—you'll get so much wear out of this. 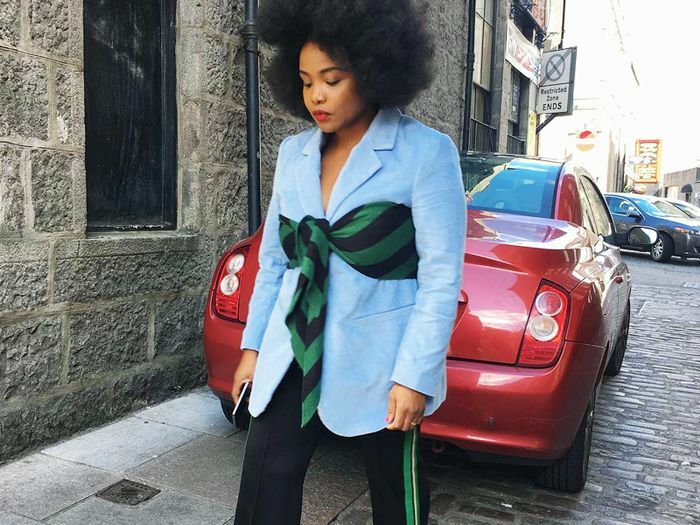 Style Notes: From subtle heritage checks on single-breasted cuts to bold, graphic longline coats, this is one of the biggest, most wearable trends when it comes to outerwear. Style Notes: This is a no-brainer if you want something smart enough for work that you can also style with top-to-toe denim on the weekend—you can't go wrong investing in a well-cut camel coat. Style Notes: One of the most practical yet impactful outerwear trends has to be vinyl. Choose between bold primary hues, something sheer for layering over jeans and a crew-neck knit, or keep it chic and try a black trench style—this is the ultimate off-duty option, and it's going to be huge for A/W 18. Style Notes: Your weekend wardrobe will feel instantly cooler with a shearling coat. Style with statement trousers like influencer Alexandra Carl, or try teaming yours with indigo denim and cosy knits. Style Notes: The robe coat will always be a winning option. Stick to shades of grey, camel or navy for wear-with-anything potential, or try out a pastel by slipping into something powder blue or pink. Style Notes: Not all winter coats need to be bulky. A collarless design is ideal if you're looking for a dress coat or a style to wear over tailored separates. Style Notes: Maxi coats in cosy fabrics are guaranteed to keep you warm during the depths of winter, but you can avoid feeling swamped by styling yours with heeled boots and bold accessories, or look for tailored shapes with a belted waist. Style Notes: No winter wardrobe is complete without a faux-fur coat, and luckily you'll never be short of choice with this trend. Look to fun striped versions or something leopard, or go all-out bonkers in a pastel hue—there are so many playful options out there already.